The Victory Vegas Jackpot has never reached a higher level of attention to detail then on the Ness Series. These bikes easily stand out as being top notch custom machineries and it is all due to their custom paint, chromed fork, swingarm, tear drop mirrors, billet wheels and a hand-stitched leather seat. There is no production motorcycle that would compare to it because nobody else thought things as Victory and Ness do. It all started in 2005 with the Purple Haze painted Victory Ness Signature Series Vegas. The bike featured all of the mechanics found on the normal Vegas: 92 cubic inches SOHC, four-valves per cylinder, including the fuel injection system with 44mm throttle bodies. The five-speed gearbox was also there together with the belt final drive. 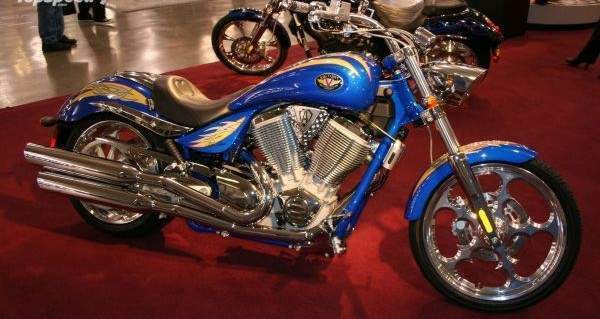 In 2006 things had evolved and mechanically, the Vegas Jackpot was an upgraded bike (100 cubic inch engine and six-speed gearbox) so the Ness family had to keep up with the manufacturer’s progress. It did it by introducing two new amazing colors, Arlen-Supersonic Blue/Graphic Cory-Black with Blue Flames. For 2007 displacement has decreased to 99.71 cubic inches and the collaboration between Victory and Ness has fructified through the new colors with which the bike entered the scene last year: Blue/Graphic, Black with Blue Flames. When it comes to limited edition production models the design is incredibly important because it stands as the first noticeable difference between the simple and the special models, in this case the Jackpot and the Ness Series Jackpot. Considering the fact that mechanically the bikes are all the same, every single stripe of paint must be well thought over. I am talking about paint job because apart from that there are no visual changes being done to the Ness Series. There is the same stylish gas tank featuring flowing lines and the carefully designed custom fenders a whole lot of chrome, but even more visual attraction. What will definitely make people turn their heads are the unique Multiple colors found on the Arlen Ness and Cory Ness (two-tone Black and Silver with Graphics and two-tone Black and Red with Graphics), but the solid Black, solid Midnight Cherry and Solid Broadwalk Blue won’t disappoint anyone. Also, a big difference between it and the normal model is the hand-stitched leather seat while the chromed elements such as the forks, swingarm and tear drop fender will shine proudly on both Ness models. What came different on the bikes are the custom rims. 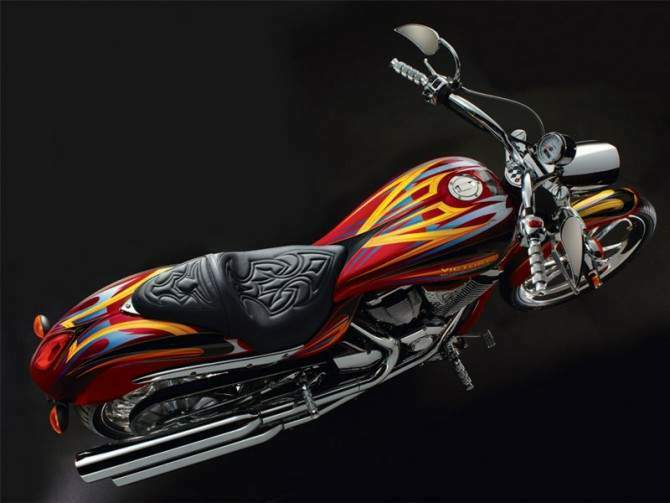 The Arlen Ness features stylish six-spoke wheels while the Cory Ness features tribal-like rims. Ultra fat 9.84" (250mm) rear tire - Engineered to deliver easy cornering and a smooth ride, the wide Dunlop Elite 3 rear tire is showcased under the stylish rear fender. Chrome swingarm - This long stretch of chrome brightens the bike considerably and complements its total custom styling. 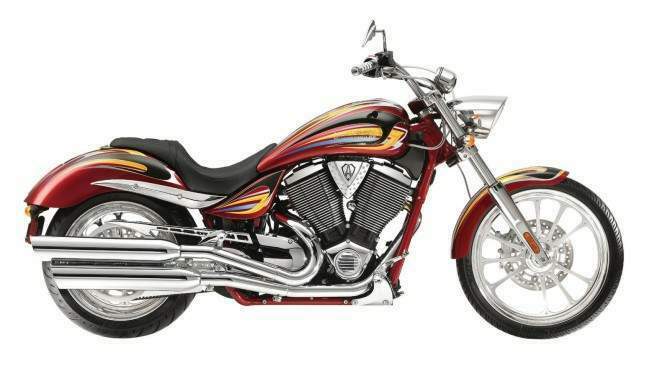 Arlen Ness designed paint - The sunset red with graphics paint scheme on this limited edition model was created by Arlen Ness himself. Ness billet grips and footpegs - Their premium quality construction and distinctive Ness design completes the bike's unique styling treatment by Arlen Ness. Ness custom mirrors - These teardrop designed mirrors combine style and function as they give the handlebars a custom look and provide the rider with great visibility. Ness custom billet wheels - Cimpleting the bike's full on Ness styling treatment, these unique Ness wheels turn heads as they roll up the miles. Limited Edition - Each limited edition Signature Series Vegas Jackpot is numbered and carries a stainless steel badge that holds the signature of the builder himself - Arlen Ness. Gorgeious diamond cut cylinders and cylinder heads - This is top level custom treatment with more than 1,000 handmade marks, makes the bike look like it just rolled out of a custom builder's shop.